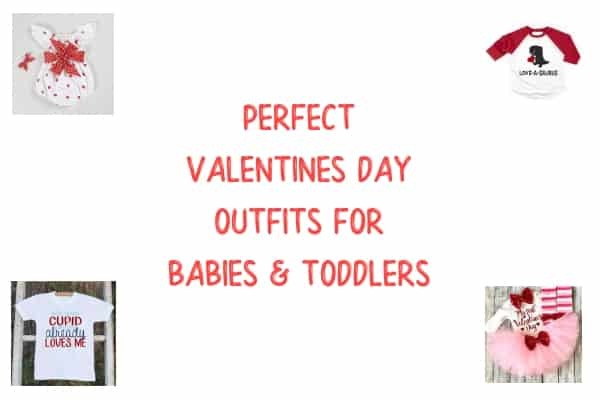 A cute Valentine’s Day outfits is a must have for your newborn, baby, or toddler. There are so many options to choose from! Here some of the cutest ones I’ve found! Many of these are from Etsy but I’ve included some from other stores as well in case you’re in a time crunch. Shopping on etsy is great as you’ll find unique items and be supporting small businesses, often other moms. But please remember to always check the shipping time to ensure you can get your item on time for the big day. Is your baby celebrating their first Valentine’s Day? 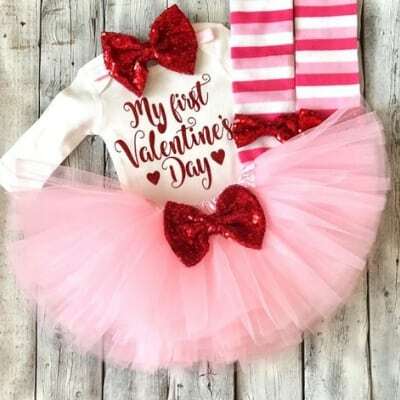 Whether you have a boy or a girl celebrate with one of these cute outfits for baby’s first Valentine’s Day. This cute little outfit comes from the bodysuit alone up to the entire outfit pictured here. The shop has several other cute Valentine’s Day bodysuits as well with different cute sayings. 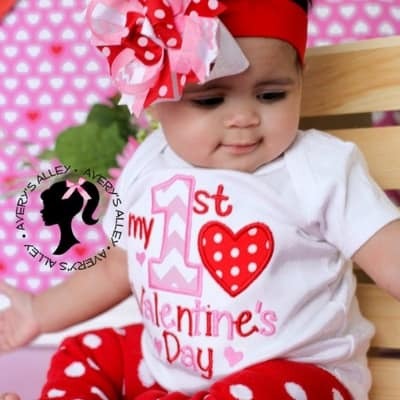 Cute and simple for your newborns first Valentine’s Day outfit. Maybe you’ll even make a buck off this Kisses 25c bodysuit. How cute is this bodysuit?! It’s machine embroidered as well. Grab it from Averys Alley and you can pick up the bow or leg warmers to create a complete outfit. If you’re shopping too late too buy on Etsy try this adorable heart covered outfit for your baby girl or the dapper valentines day outfit below for you little boy. 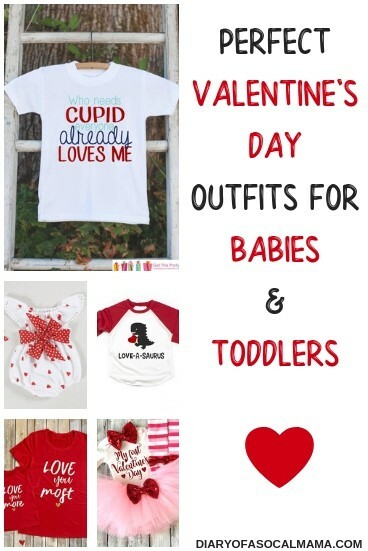 These Valentine’s Day shirts and outfits for toddlers are too cute to miss! There are plenty of cute options whether you have a girl or a boy. Some are also available in smaller sizes as well if your trying to match baby brother or sister. 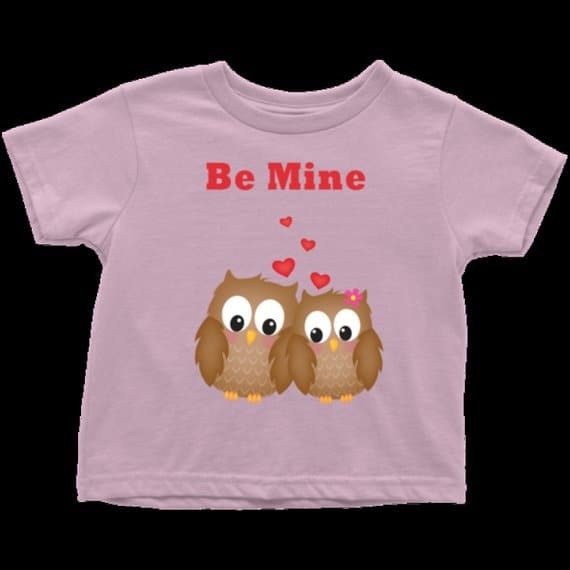 I love this cute Owl shirt that says Be Mine! Shirt is available in pink or white. This one is actually designed by me and can be picked up in the Diary of a SoCal mama Etsy store! 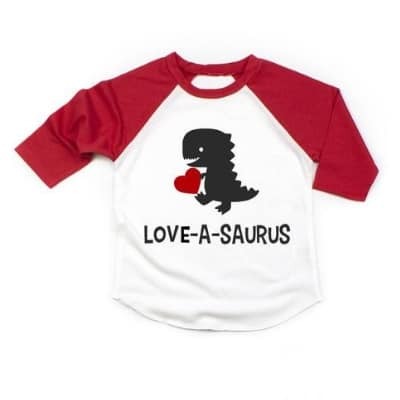 Dinosaurs are perfect for a boy or a girl and I love the red sleeves! Available in a few different colors and a bodysuit as well for sizes 12M-5/6T. Get it at the HappyLionClothing Etsy store. 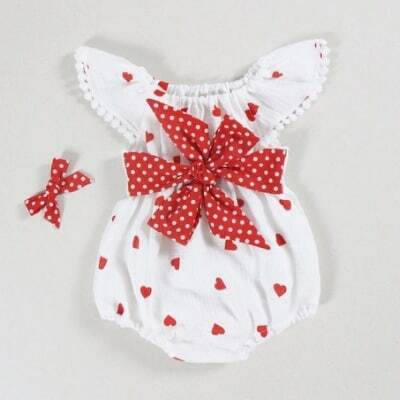 This beautiful white heart romper may not look like a toddler outfit but it’s actually available from size newborn-4T. They have the same cute romper style in other patterns as well! 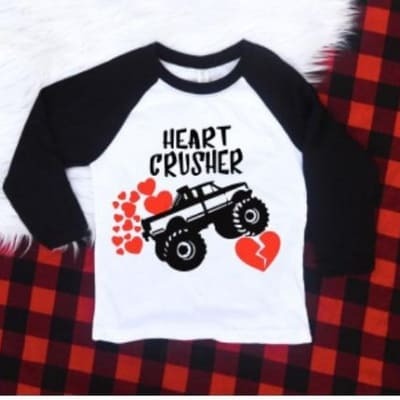 Little boys will love this monster truck inspired Valentine’s Day shirt that reads “heart crusher”. This one is available for size 2T-XL(14-16) so it’s great for big kids too! This tee is simple yet cute! 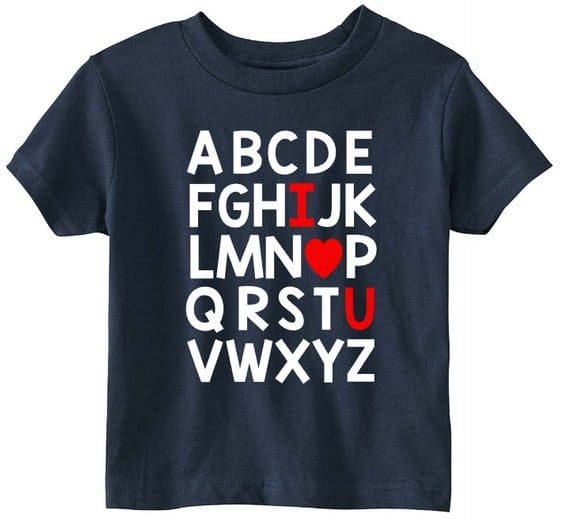 I love the alphabet inspired theme with the hidden “I love you”. It’s available in 8 different colors in size 6M-youth XL so it will fit all your kiddos! I’ve seen this cute tee floating around all over Pinterest so clearly it’s a fan favorite. 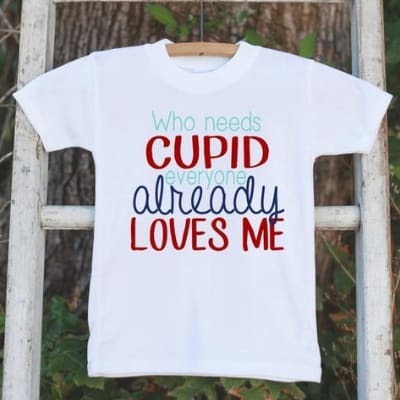 The shirt reads “Who needs cupid, everyone already loves me”! It comes in several color variations and as a baby bodysuit too from sizes 3M-youth XL. This 3 piece outfit screams Valentine’s Day but is cute enough to wear all year long! This little gem is available on Amazon in size 2T-8T. Available in size 6M-4T and in 10 different colors this simple tee is cute for a boy or a girl and you can get a color to match any pants! The shirt reads “Mommy is my Valentine” which is just too sweet! If you love the mommy & me look these ones might be perfect for you! 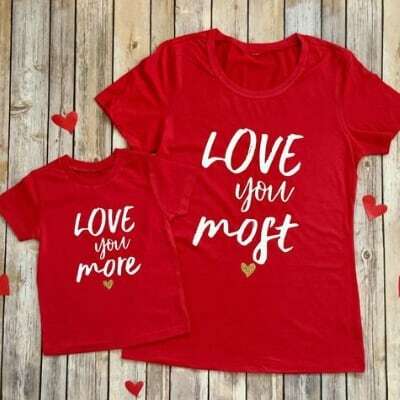 The cute matching shirts read “Love you More” & “Love you Most”!